Kiawah Island is a barrier island located approximately 20 miles south of the historic city of Charleston. Kiawah has ten miles of pristine beach and five world-class golf courses, including the famous Ocean Course. The island also provides over 30 miles of paved leisure trails, tennis, and plenty of family activities. Our home was brand new in April, 2001. Features include an open floorplan with a two-story great room, hardwood floors throughout living area, carpeted bedrooms, and tile bathrooms. The kitchen is fully stocked with utensils and appliances, and bed and bath linens are supplied. There are ceiling fans throughout the entire house, including the front and back porches. Enjoy your morning cup of coffee in one of the comfortable rocking chairs on the front porch. Spend the afternoon on the spacious, well-furnished back porch, which also features a screened-in area. Your whole family will be able to take advantage of the heated swimming pool (April until end of October), and should you choose to spend the day at the beach, it is a 13-minute walk or a seven-minute bike ride. You can rinse off the sand in the outdoor shower when you get back! The first floor features a master suite (king-size bed) with a private bath that has a jacuzzi tub and separate glass shower. Also on the first floor is a bedroom (queen-size bed) with private bath. Move into the two-story foyer and up the stairs, and you will find two more bedrooms (queen-size bed, two double-size beds) that each have their own bathrooms and private balconies overlooking the pool. If you are interested in entertainment, all 4 bedrooms have Cable TV and the master also has a VCR. The two-story great room offers a Cable TV with DVD/VCR, stereo, CD changer, and surround sound in the lower level with speakers for the rear deck. The open floor plan provides a steady flow throughout and makes it easy to socialize no matter what room of the house you're in. Have a sit-down dinner with your family at the dining room table that seats ten. Overall had a great stay. House is very clean and organized well. Matt was very efficient in providing paperwork and instructions. Would stay here again. Minor are: some kitchen cabinet doors need to be replaced (cracks), one area of driveway has a 2 inch step up that’s easy to trip on, perhaps get a larger tv and place it on the wall in the family room (hard for all to watch March madness). Thank you for the review on our home. We're glad you enjoyed your stay and would love to have you back again. We hope to address the few minor repairs you had mentioned in the near future and always keep the house great shape. Excellent accommodations for our family! We stayed at this lovely home for our Christmas break. It was spacious and well kept! Our children loved the space with each having their own bedroom. The pool was lovely especially with the heat feature. The neighborhood is quiet and perfect for long bike rides and walks on the beach. The beach is a short bike ride away. There is a convenient town center in the neighborhood and a bigger selection of restaurants and stores 10 minutes away. We will definitely return. Our host was responsive and easy to communicate with. Thank you for a great vacation! Thank you for the great review. It's always nice to hear that our guests enjoyed our home and the Island. The weather even cooperated and you were able to enjoy the heated pool during your stay. Please keep us in mind for another trip to Kiawah. This property was wonderful for our stay. Abundance of bedrooms and baths. The kitchen and dining area were spacious and well equipped. And it featured nice verandas front and back along with heated pool. Easy walk to the beach, and it was fresh and well maintained in appearance and function. Would recommend it to any large family who enjoys sharing time and breaking bread together. We really appreciate the great review and Thank You for submitting it. We try to keep it a beautiful place for family vacations. Great guests like you are always welcomed back! 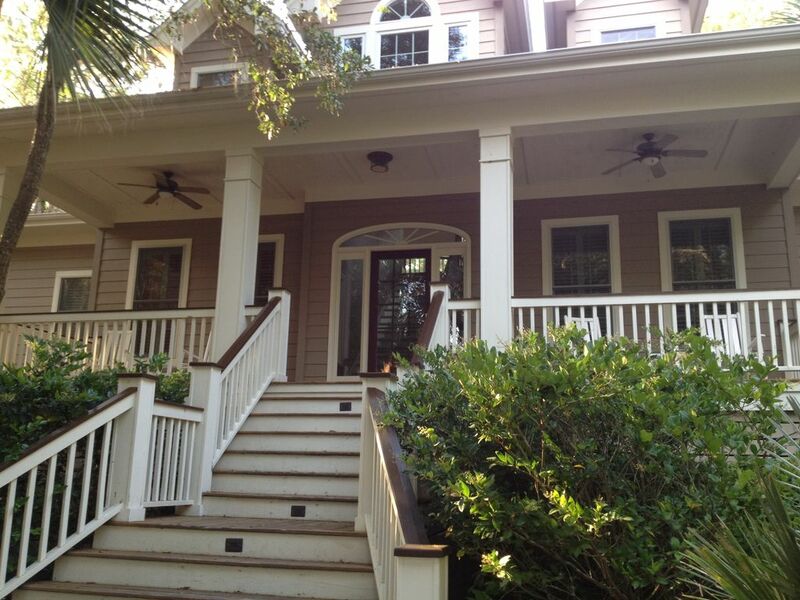 We are 4 retired couples who enjoyed a wonderful week together in this lovely Kiawah home with private heated pool . Owners were so good at communicating with us , so easy to plan our trip. It was just perfect for our group, all had own bathrooms, nice big kitchen and gas grill made for fun times making meals together . We even rented bikes ( all 8 of us are over 70, biking to the beach , and we survived!) We have been to Kiawah many times years ago , so happy to see that it is still so beautiful! We're so glad that you enjoyed our home and Kiawah Island. It really is a special place to vacation. Thanks for the great review and hope you decide to visit again in the future. Wonderful home for family vacation. One of our favorite places! Thank you for the wonderful review and it was great to have you back again for another vacation in Kiawah. Great guests like you are welcome back anytime! Great house and the pool was an added plus! We appreciate the great review and hope you have a chance to return someday. Have a great summer!